The contact of adhesive structures to rough surfaces has been difficult to investigate as rough surfaces are usually irregular and opaque. Here we use transparent, microstructured surfaces to investigate the performance of tarsal euplantulae in cockroaches (Nauphoeta cinerea). These pads are mainly used for generating pushing forces away from the body. Despite this biological function, shear stress (force per unit area) measurements in immobilized pads showed no significant difference between pushing and pulling on smooth surfaces and on 1-μm high microstructured substrates, where pads made full contact. In contrast, on 4-μm high microstructured substrates, where pads made contact only to the top of the microstructures, shear stress was maximal during a push. This specific direction dependence is explained by the interlocking of the microstructures with nanometre-sized “friction ridges” on the euplantulae. Scanning electron microscopy and atomic force microscopy revealed that these ridges are anisotropic, with steep slopes facing distally and shallow slopes proximally. The absence of a significant direction dependence on smooth and 1-μm high microstructured surfaces suggests the effect of interlocking is masked by the stronger influence of adhesion on friction, which acts equally in both directions. 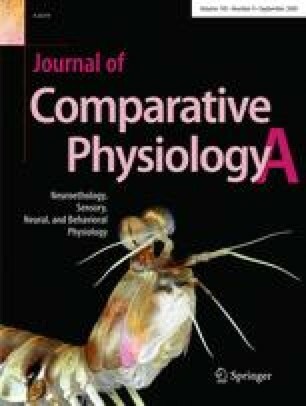 Our findings show that cockroach euplantulae generate friction using both interlocking and adhesion. We would like to acknowledge the help of Andreas Eckart, Patrick Drechsler, Saul Dominguez and Filip Szufnarowski for their help in the development of the LabVIEW motor control programmes. This study was funded by research grants of the UK Biotechnology and Biological Sciences Research Council, the Cambridge Isaac Newton Trust (to W.F. ), the EU RTN-6 network “Patterns” (to U.S.), the European Union (Marie-Curie) funding (to D.R.B. ), and the German National Academic Foundation (to J.H.D. ).